If you've been following my blog for a while, you know I love to make crafts for the boys out of old tissue boxes. And duct tape. Whatever would I do without duct tape? We just use so many tissue boxes through the year, and I hate to throw them away. They certainly come in handy at craft time! I wanted to make something for the boys to show appreciation to other family members building up to Valentines Day. So I came up with the idea of crafting a mailbox, and leaving some blank Valentines that the boys could fill out over the next couple of weeks. The twins, of course, are not writing yet so they'll need a little extra help with theirs. Paul and I will be participating too. 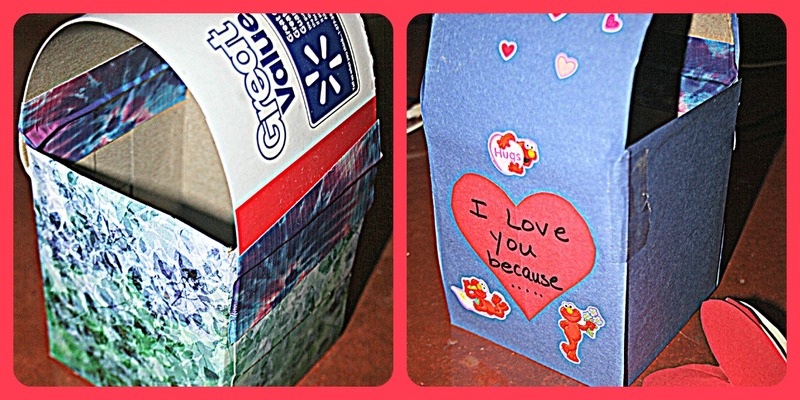 I can't wait to open them up on Valentines Day and read about the little reasons we love each other. Already, this is a huge hit with Pierce, who has been sneakily writing little valentines and placing them in the box. He is so excited to read them when it is time. Maybe this will even become a yearly tradition! This post is linked with Valentines Traditions over at JDaniel4sMom. Readers, do you send any Valentines? Oh, what a sweet idea for the boys! This sounds like a wonderful tradition to start. This is such a great idea! It really will be fun to read them. I love this idea! When I was growing up, I always tried to get my brother and mother to communicate with me via a folder I stuck on my door. Alas, it never took. This looks like a fun Valentine's Day craft! Now, that's one beautiful mailbox. Love this idea! You are all talent Lisa. The best I could do would be to use old tissue boxes in a game--stack them and then we knock them down by throwing a plastic ball. No Valentines for me other than just getting the Mrs. something. When I was growing up we used to watch Captain Kangaroo and he used to make all kinds of things out of shoe boxes and construction paper. I don't think he ever thought of tissue boxes or they were different back then. You are real creative! I love this idea so much! It will be so fun and meaningful when you read them. This has given me an idea of what to do for my husband for Valentine's Day. A very sweet craft and fun for the kids. They will cherish the memories of their little Valentine's mailbox. Good job mom and dad! This is so totally cool! And great for a child's self esteem. What a fun Mom you are!! Valentines Day is coming right up isn't it??? Many, many years ago, when I was in grade school. We made Valentine boxes from tissue boxes. We do have a comment box - where you can write good things. This was nice. Good to teach them that. That sounds like fun! We just got done with all of the kid's Valentines. Isaak's in 2 preschools this year, so it took awhile. I made him sign his name to each and every Valentine. You are so creative. i have got to try something like that with my grandchildren. how nice!I don't know if we'll do anything "special" for Valentine's day, maybe a dinner out.. I want to make some fun stuff too! What a great idea. Have a wonderful weekend.